The patented TrimSaver® system significantly impacts your operation with increased converting performance through better trim waste control. 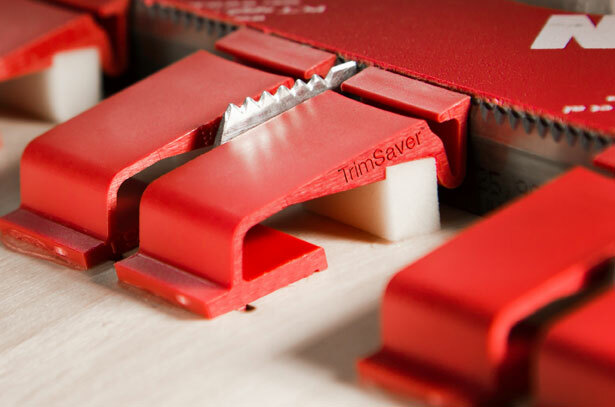 TrimSaver® applies pressure to the whole surface of the trim area and blocks any gap in which small waste can get stuck. The system’s design provides a powerful ejection to strip away waste on even the smallest trim sizes. This advanced 3-step process of pressuring, blocking and ejecting provides advanced control and results in a perfect cut every time. The system’s superior performance can save up to 66% on trim waste by reducing the total sheet size by an average of 2%. Because of its superior control, the TrimSaver® system can work with reduced trim of as little as ⅜” lead and trail edge total trim and ¼” total side trim. TrimSaver® 2 improves the system’s performance on the lead edge, using a wider and more dynamic profile combined to a precisely calibrated motion.